Hello lovelies! I've had a packed day today with work all morning [it was TASK day, so I was unloading boxes and stocking shelves the entire time at Ulta], came home for lunch before heading out for most of the afternoon of shopping with my Mum for the Seniors Luncheon which is tomorrow at our Church. If you are a newer reader, the Seniors Luncheon is an event that I have been apart of since my junior year of High-School [which was 2007], but me and Gaby took over the event last Spring and have been running it ever since. We prepare and serve a lunch and dessert to the elderly in our Church and sometimes their friends, once a month, on either the second or third Wednesday of the month from about March/April to November. It is lots of fun, though a bit tiring after standing on your feet all day working hard. After getting home from work I knew I wanted to wear something colorful, yet was comfy and would keep me from feeling too wet when I went shopping with my Mum [it was pouring outside at the time]. Knowing this, and that the weather was changeable [in both temperature and conditions], I first decided that I really wanted to wear my combat boots since they are weather-proof, so I paired them with some trouser jeans that I found buried at the bottom of my pant pile in my closet. 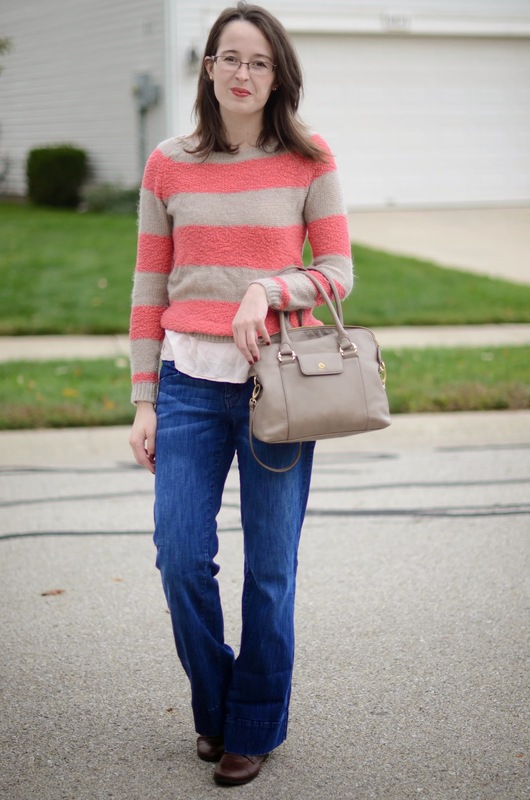 For my top, I kept on my pale pink top [which you can see peaking out beneath my jumper] from my work outfit [would have done a work outfit post instead, but it was raining buckets outside] and just threw on this coral & tan jumper from Kohl's over my top and I was good to go grocery shopping. Well, I better get going, as my feet and calves are killing me and I need to soak my sore muscles in a nice hot bath with some bath salts and bubbles. I haven't been a bath person for the longest time, but with my retail job I find myself craving one all the time. What a pretty sweater! I love the coral stripes! Such a cute fall look! I love using coral as a pop of color! Such a pretty outfit! I love that sweater! LOVE your outfit (of course), Ash! Your hair is the cutest. Wish I was there to go grocery shopping with you! Ha! I have to say I'm glad I'm not the only one who's legs are aching after a day of standing at work!!!! 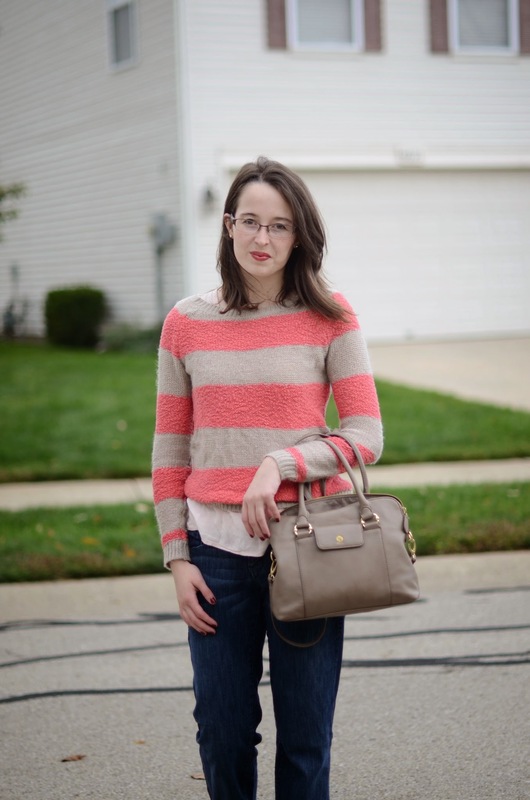 That coral sweater makes me want to break out a bottle of lovely coral nail polish!